If you want to know what new technologies await you in the future, you should visit the research labs of technology companies today, and look at the alphas and betas of proposed technologies. Some will turn out to be useless, impractical or just a fad. But some would become the kernels of a new technological future. In this post I'll review some of those pending ideas, stewing in the labs of 4 big technology companies. I can't even begin to cover everything, but since this is my blog, I can cover what interests me . I will, however, leave you with all the links and material to conduct your own independent research. I do recommend at least a quarterly visit to these research sites, to learn about new innovations. 1. How many red letters do you see in the picture? 2. How many times does the letter 'K' appear in the picture? Have you noticed that providing the second answer took much longer than the first? That's because our brain can process color much faster through our visual system, than it takes to actually read content. Many new technologies can arise from this observation (think about highlighting content in a document or a web page in different colors, based on the content type) and here's a first practical use I'm actually testing now. Chromatabs is a Firefox add-on that colors each tab based on it's name. The algorithm takes the web site's URL, turns it into a hash and assigns a color to each tab based on a conversion of the hash to HSL values (Hue, Saturation, Light - another way to codify colors, similar to RGB). The result, once you get used to it, means I can tell you how many tabs are pointing to the Google domains (purple), my blog (brownish) or Mozilla Labs (pink) without bothering to read the titles. Read more about Chromatabs here. 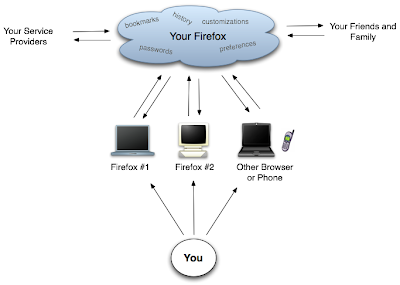 The second technology from Mozilla is a take on an old idea, the weaving of desktop and web together. This idea is offered by Google (through it's bookmark add-on and search toolbar) and Microsoft. Mozilla Weave is another take at trying to convince you to store all your personal information (bookmarks, history, passwords, form completion strings etc.) in "the cloud" to allow access from different computers. Since I own more than one computer and I find myself needing a URL or a password from time to time, I find this technology appealing. But until I understand who protects my content and privacy in "the cloud", I think I'll stay on the sidelines and wait. Digg.com, the social network site, allows you to submit a link, an image, or a video you have "dugg" and others to join you in promoting that link (read more here). Like many other sites, they have found that they have too much information and not enough space/time to share it with the visitors. For a while, there was a limited list of links, that had enough "diggs" to make it to the front page. And the competition was fierce (with the occasional cheats, hacks and fights). But what about the real, interesting content that was buried under the Paris Hilton pictures? How do you expose that? My Master thesis dealt with visualization of data mining results, so I can relate to this problem. 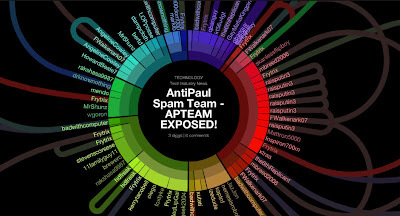 Indeed, I'm currently raking my mind on how to expose the contents of this blog to the casual user (all he sees are the 7 last posts, 10 hand-picked posts on the right side - which may interest me, but not that reader, and 10 topic tabs - which again, might not meet his taste). 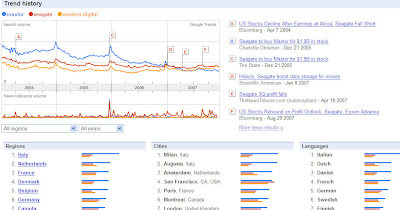 That's why Digg Labs approach to visualization knocked me off my feet. Try some of the other visualizations. And you can also download them to your desktop as screensavers. Oh, and don't forget to digg this article . So many ideas to choose from... A company that allows its workers to work on whatever they like for 20% of their time, is bound to come up with some great ideas. Many of the technologies in the Google Labs mature into a Google product later on (indeed, the main page contains a list of "lab graduates", such as Reader, Docs, Notebook etc.). 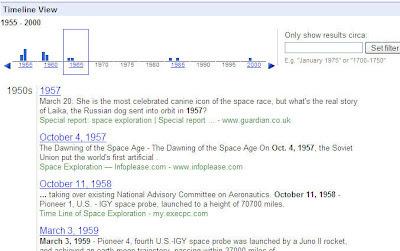 Experimental search allows new visualizations of search results (Google's bread and butter). There are some more interesting views, along with keyword suggestions, different results navigation schemes and keyboard shortcuts. Try comparing "PlayStation 3, Xbox 360, Wii" for example. Think about future possibilities. If you could assign weights to certain criteria, a tool for global data comparison would become rather handy. By far the oldest and biggest of the research labs mentioned in this column and rivaled, perhaps just by IBM research labs. Microsoft researches dabble in so many areas, paradigms and methodologies, that it's hard to highlight just 2. In the past, I've written about Virtual Wi Fi, now I'll try to avoid the temptation of picking up software development advances (such as parallelism, or new .Net technologies) to avoid boring people. VIBE (Visualization and Interaction for Business and Entertainment) is a lab concentrating on utilizing visualization techniques to improve interfaces of business applications. GroupBar, for example, allows you to arrange your windows better in the taskbar. It can also be downloaded now as an application (as opposed to some of the other researches, still in early stages). We have all seen CAPTCHAs (Completely Automated Public Turing test to tell Computers and Humans Apart) before, those annoying characters, printed on unreadable background, designed to separate humans from computers on web sites. Well, not only do they cause grief to humans, but, as I've recently blogged, OCR apps are getting better and better at deciphering those strings. Enter Assira - a project that intends to replace CAPTCHAs with pictures of kittens. You see, a computer may be able to tell a "c" from a "d", but it can't tell a cat from a dog in a picture - while a human can do so quite easily. Powered by a database of 3 million cat pictures, Assira is just another way web services can prevent non-humans from accessing data. That's it for now. Expect more lab reviews in the future.